HTC did schedule an event on the Mobile World Congress 2014, but we weren’t expecting any big news to come from the Taiwanese OEM in Barcelona as the company already scheduled an event on 25th March where its expected to unveil its primary flagship device for 2014. The company, however, did announce a mid-range device at the show floor in Barcelona dubbed as the Desire 816. We’ve seen the device in the past few weeks as Desire 8, and it turns out it looks quite similar to previous leaks, even it’s specifications. 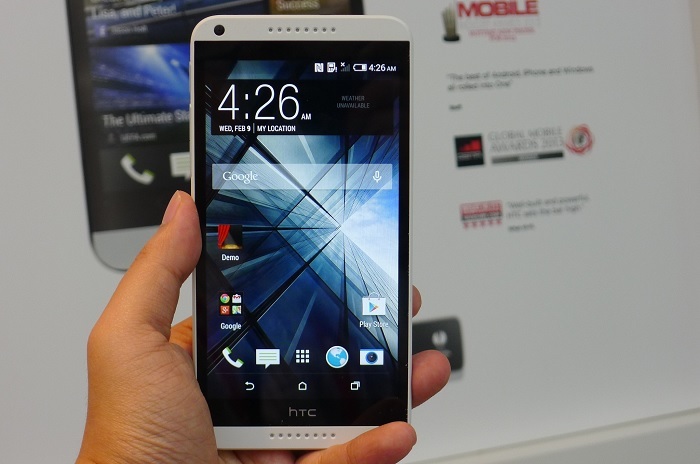 The specifications of the HTC Desire 816 turns out to be similar to what we’ve seen in the past. The handsets rocks a 5.5-inch display sporting a resolution of 1280 x 720 pixels, and is powered by a quad-core Snapdragon 400 chipset clocked at 1.6GHz with 1GB of RAM and 8GB of RAM with expandable storage via microSD card slot of up to a whopping 128GB. On the rear, HTC Desire comes with an impressive 13MP camera for photos and videos as well as a 5MP front-facing camera. Other features includes a 2,600 mAh battery, LTE connectivity (depending on market), nano-SIM support and will come with Android with Sense 5.5 UI — the company didn’t mention which version, but we’re guessing it’s Android 4.4 KitKat. It also has the on-screen buttons we’ve seen previously. There’s no word about the pricing of the handset, but it should hit retail shelves globally in Q2 later this year.